The Riverside Transportation Department supports all district transportation needs, including special needs transportation, accommodating all extracurricular and activity trip busing needs, and providing vehicles for employees to attend workshops and conferences. 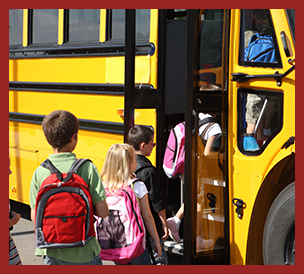 Our Transportation Department is committed to safely transporting children to and from school. This safety requires shared responsibility by the bus driver, students, and their parents. As always, safety is our number one consideration as we establish bus routes and provide student transportation. Be at bus stop 10 minutes prior to scheduled pick-up time in the morning. Be on time to the bus in the afternoon. Stand a safe distance from the curb or highway. Be courteous to the driver and other bus passengers. When crossing street by school bus, always cross in front of bus. Sit quickly and quietly in assigned seat. Remain seated facing forward in your assigned seat while the bus is moving. Do not block the aisle at any time. Always identify yourself when asked by the driver. No eating, drinking (except water in plastic bottles), smoking, chewing gum, or spitting inside the bus. Keep hands, head, arms, and all objects inside the bus at all times. Talk in normal tones; we prohibit loud, rude, vulgar, or obscene language. Keep the bus clean and free of damage. All items carried by students (i.e., band instruments, athletic equipment, backpacks, etc.) must be under their control at all times and carried in the lap, between seats, or properly secured in a vacant seat. Instruments cannot occupy needed seating space or be placed in the driver’s compartment or in the stepwell. Skateboards, scooters, and roller blades are not allowed on the school bus. Students are permitted to use only their designated bus stops. Any changes require a parent/legal guardian’s written request, counter-signed by a school official. Students are permitted to ride only their assigned bus. Any exceptions must be requested in writing by the student’s parent or legal guardian and approved by a school official. Remain seated while the bus is in motion and until it comes to a stop. Riverside students are required to show their student I.D. card to the bus driver upon request and prior to boarding the bus. To find out where and when the bus will stop, check out the routes and schedules below.